The social consequences of the 2007 economic crisis led to the emergence of previously marginalized political forces. New parties in Greece, Italy, Spain, and France brought long-standing institutional equilibriums into question. The case of Podemos, whose whirlwind victories threw the two-party political machinery into turmoil, is particularly instructive, illustrating the contradictions that await the radical left once it enters political institutions. Its new situation enables it to give political expression to social struggles. But these struggles have been weakened as the party navigates between the perils of marginalization and recuperation. Looking at the links between Podemos and housing rights protest movement sheds light on how such movements can become institutionalized. Podemos' whirlwind rise to become the third political party in Spain just two years after being founded in January 2014 has run into the classical contradictions facing the radical left once it enters political institutions. Does its arrival in parliament signify the political impact of social movements issuing from the economic crisis, or on the contrary mark their abatement and betrayal even? The appearance of a new political force in Spain has broken the two-party machinery and is the ideological outgrowth of the protest movements. Yet it equally presupposes a break with its origins in the Indignados movement and the revolutionary left. One possible course is to maintain radical positions and links to social protest, but this can come at the cost of political isolation. Another is to accept the previously contested rules of the state game, the path taken by Syriza in Greece which, despite its social base, has given way since July 2015 to demands from EU institutions. There are a whole range of options between the two outlying scenario of political marginalization and institutional illusion, both of which find expression within Podemos. The situation is comparable to that of La France Insoumise, the left wing of Corbyn's Labour Party, and the new socialist current of Bernie Sanders amongst American Democrats. It is also reminiscent, though obviously in attenuated and highly dissimilar forms, of the old dilemmas that have faced the "radical" left – be it reformist or revolutionary, for the distinction becomes blurred in such situations. Examples would include La Montagne MPs in the 18491 French Assembly, the Russian social democrats in the Tsarist Duma of 19122 , and revolutionary involvement in the popular fronts of 19363 . Seen in this light, Podemos faces a more existential choice than those posed by parliamentary agreements and forthcoming elections. It provides a concrete way of understanding how a social movement is institutionalized, whether this is perceived as burying social protest4 or, on the contrary, giving it new political life in spheres previously hostile to the new political agenda5 . One way of approaching the problem is to examine the issue of housing, which lay behind the 2007 crisis and triggered a powerful wave of political radicalization. After a decade-long property bubble channeling nearly a quarter of the country's Gross Domestic Product6 , nearly half a million families were faced with the threat of eviction due to mortgage arrears7 . This led to a mass movement against the banks, debts, and even, to a certain extent, the regime of housing ownership. Podemos' policy program, cadres, and political tactics and strategies are largely attributable to this social protest movement, which unleashed a wave of political change sweeping through municipalities and provincial, regional, and national chambers. But though political success can lead to demands behind voiced at the heart of political institutions, it can also sap the driving social force. 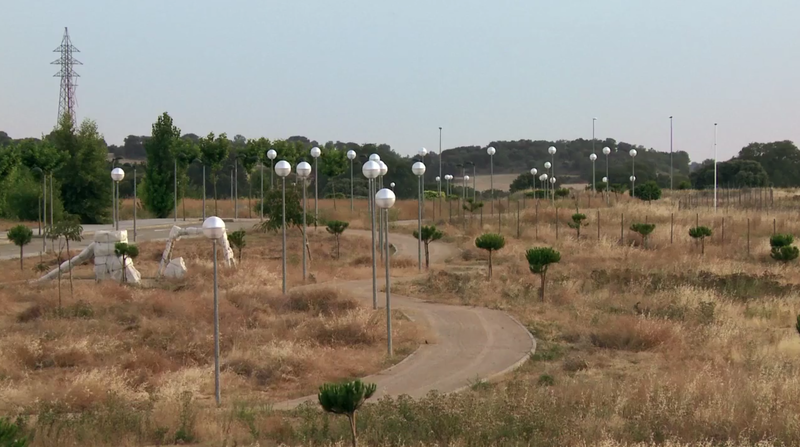 The Spanish property bubble' consequences: Valdeluz, symbol of the ghost town after the crisis. Bricks, Quentin Ravelli, 2017 ; photograph Cécile Bodénès. The December 20, 2015 general election ushered in a political crisis without precedent since 1975 and the end of Francoism. The arrival of new political parties, such as Podemos to the left of the Socialist Party and Ciudadanos on the center right, led to the Spanish lower house being fragmented into a string of parliamentary groups unable to find common ground. As shown by Héloïse Nez, Alberto Amo, and Alberto Mínguez, and by Mathieu Petithomme and Alicia García8 , Podemos' target was to overtake (sorpaso) the Socialist Party, which would have put it in a strong position to form a government in its own image. But this did not happen, and no one group won a majority. Under the Spanish Constitution, an absolute parliamentary majority is required to form a government, thus for several months Spain found itself without one. The People's Party, which garnered the most votes despite the right being tarnished by years of corruption scandals, was unable to convince the Socialist Party to enter into an alliance. The Socialist Party, for its part, preferred to enter into an agreement with the centrists from Ciudadanos. But the resultant number of MPs was not enough to form a majority, and the Socialists looked to their left for a pact. However, Podemos refused to enter into an alliance with a PS open to the center right, preferring to turn to Izquierda Unida, a political coalition based around the Communist Party, and also backed by the En Comu and En Marea platforms9 . This squaring of the circle led, paradoxically, to a weakened, minority People's Party retaining its control of the executive. As for Podemos, though it did not overtake the Socialist Party in terms of votes and influence, it did open a new chapter in Spain's political history. It was the first time a new party came to upset the joint hegemony of the Socialist Party and the People's Party. It did so on a manifesto based on expanding public services, introducing a basic income, increasing the guaranteed minimum wage, a shift towards renewable energy, a refusal to increase retirement age, opening borders, and an immediate end to housing evictions, amongst other measures. More profoundly, these political changes instigated a new relationship between political institutions and social movements. New blood in the Cortes. The clash of appearances and social origins. Seen from the parliamentary benches, the arrival in December 2015 of 69 MPs from Podemos and its allies (as against 123 for the People's Party, 90 for the PSOE, and 40 for Ciudadanos) marked a clear turning point, not only in political and ideological terms, but also socially too. Rita Bosaho, born in Equatorial Guinea under Spanish colonization, was the first black woman to be elected to parliament. Alberto Rodriguez, a worker from an oil refinery in the Canary Islands, officially backs the idea of class struggle. Carolina Bescansa, who entered Parliament carrying her six-month-old child in her arms, despite there being a parliamentary crèche, subsequently said: "it is time to bring the street into our institutions to make this chamber resemble our country more closely"10 . The event was popularized by many photos, bestowing a family-friendly, feminized, and diversified image on this new group, in a parliament deemed to be cut off from the electorate and discredited by a string of corruption affairs. One of these photos, which did the rounds of the European media, resumes – and reduces – this social encounter to a "culture shock"11 . It shows a Podemos MP wearing a top with the words "Working Class Hero" printed on it, while Alberto Rodriguez, with dreadlocks and a T-shirt, passes in front of Prime Minister Mariano Rajoy, wearing a suit and tie, and looking on bemused. In terms of policy the break went deep indeed. Mariano Rajoy had been behind the austerity measures, drop in salaries, closing of borders, and support for the banks continuing with eviction procedures for mortgage arrears. Alberto Rodríguez presents himself as an anti-capitalist, in favor of increasing the minimum wage by 300 euros, an end to anti-immigration measures, and halting the evictions demanded by the banks. But the media insistence on appearance and personal style tended to conceal the conflicting policies from view, focusing on a stylistic and generational slant, which though real was only secondary. Equally, the social distance between Mariano Rajoy and Alberto Rodríguez also attracted a certain degree of journalistic attention. Mariano Rajoy, the son of a prominent magistrate from Santiago de Compostela, had been minister for public administration, for education, and then for the interior, and prime minister since 2011. Alberto Rodriguez, the son of a secondary school teacher and a chemical industry technician, had spent his childhood in a 69-square meter flat that was home to a family of eleven. He had been an activist with the Canaries Students Union, and then Izquierda Unida, while working for nine years as an operator then Comisiones Obreras (Workers' Commissions) union delegate in an oil refinery belonging to the CEPSA group. He was arrested in 2012 for having taken part in Indignados protests. This was not the first social shock of its kind within a national legislature. It is one of a long line of atypical arrivals in parliament, confronting not only totally opposed policies but also social groups, such as the Russian revolutionary socialist MPs in the 4th State Duma in 1912. As described by Alexis Badaev, the group of fourteen Menshevik and Bolshevik MPs, some of whom were peasants and workers, stunned the Constitutional Democrat MPs, representing the Russian liberal bourgeoisie and in favor of maintaining the monarchy12 . There was a similar confrontation of social milieus when Podemos entered parliament, embodied in the media by Mariano Rajoy looking on as Alberto Rodríguez passes by, but also by the presence of Rita Bosaho and Carolina Bescansa. Yet the case of Podemos is differs to quite some extent. First, because class identity was downplayed within the party in favor of a more consensual political identity based on the "people" against the "caste", where the caste represented corruption. Second, because the Bolsheviks thought of their action in the Duma as a propaganda tool, using it as a political platform, and not as a legal object for conquering power by election. Third, because the rising curve of protest in pre-revolutionary Russia was, on the contrary, on a downwards turn in 2015 Spain, raising the question of institutionalization in very distinct form. Despite these essential differences, the socio-political confrontation was nevertheless remarkable, as illustrated by the policy struggles between different tendencies within Podemos. On the left, the cover of the Alexis Badaev's chronicles, a Bolshevik MP in the Tsarist Duma. On the right, Rita Bosaho and Carolina Bescansa, Podemos MPs in the Spanish parliament. Activists and current cadres of Podemos – and many of those leading the party – have been active in social movements over recent years, particularly in the Indignados district assemblies to support health and education workers, striking factory workers, and call for a right to housing and denounce financial speculation13 . One such case is the spokesperson for the entire parliamentary group, Irene Montero, a former pillar of the Plataforma de Afectados por la Hipoteca in Madrid, the Platform for People Affected by Mortgages, which became a mass movement at the heart of the country's political preoccupations. Activists from movements combating evictions often got up at dawn to occupy banks despite the police presence and call out those behind political decisions authorizing the repossessions. It was within this context of social ferment, in September 2012, that many future Podemos activists, and certain MPs, took part in the rodea el congress operation. This protest, in which Parliament was encircled, was severely repressed, resulting in 34 people being taken into custody and 64 hurt. The "Encircle parliament" operation, launched by the anti-capitalist current within Podemos on the day of Mariano Rajoy's investiture. Four years later, they found themselves inside the same parliament, only this time (consenting to be) encircled rather than encircling, when there was a rerun of the operation in October 2016. Before Podemos' 2015 victory, the lower house was, for the Indignados, a place from which to be expelled, not a place to be conquered. This may be seen in the February 2013 photograph, taken one year before Podemos was set up in January 2014, showing two Plataforma de Afectados por la Hipóteca (PAH) activists, including the future mayor of Barcelona Ada Colau , voicing the anger of the afectados , the over-indebted victims of high-risk mortgages14 . The PAH, however, says it has "no party affiliation" and defends its status as a social movement so emphatically that its activists are not even allowed to hold political responsibilities or be a party official. They view institutions as spheres in which to intervene, as places to upset the social mechanism, not partake in elaborating it. The photo, taken moments before an eviction, shows the explicit determination to upset the parliamentary order. But the target was primarily the media, and external to the political institution. It was a matter of disseminating and denouncing a certain representation of the parliament, an institution which according to the PAH and future Podemos activists is cut off from the social reality facing the country. The picture of activists being evicted echoes images of mass evictions by banks of people unable to pay off their mortgages. In contrast with the PAH, Podemos' strategy for conquering central power has been based since 2014 on a reinterpretation of Gramsci's concept of hegemony. In his doctoral thesis Pablo Iglesias15 , the founder and leader of Podemos, argues that alter-globalization movements, which had long been reduced to impotent radicality, started to expand from Genoa in 2001, enabling it, he suggests, to address larger segments of the population and thus impose a new political hegemony. The concept of hegemony, developed in Gramsci's Prison Notebooks, together with the idea of a "crisis of hegemony" put forward by Wallerstein, are acclaimed by the Podemos leadership core, in the wake of the philosopher Chantal Mouffe16 . This is the intellectual framework within which the idea of effectively conquering power in parliament and potentially the government was theorized. Yet putting it into practice led to certain social power dynamics, such as those brought into play by the PAH, being replaced by electoral power dynamics, considerably shaping how Podemos sought to put its ideas into practice. Indeed, winning control of municipalities and setting up an influential parliamentary group without thereby running the state or large companies presupposes major compromises with the existing authorities. Admittedly, municipalism is an acceptable solution for many activists because, though reluctant to enter into what they regard as compromise, it provides a way of anchoring municipal power in a form of direct democracy, thus sometimes called "assemblist"17 . But countervailing powers that are viable in small municipalities become far less so in larger bodies, such as the city halls in Madrid, Barcelona, and Valencia, without even mentioning the "national" parliament. Despite having the backing of parties opposed to evictions, city mayors were in fact unable to effectively oppose their implementation, for it was not within their authority. This ambivalence explains why some of the party base is concerned about the increased significance accorded to institutional strategies. Carrying on where the Indignados movement left off, many Spanish people call for direct democracy organized at the district level and independent of state structures. The resolutions posted by the Lavapiés district assembly in Madrid illustrate the social consequences of the housing crisis. 1. Every day more and more people and families in our district are in dramatic situations: people evicted from their housing, families living in insalubrious and inhuman conditions, people threatened and aggressed on a daily basis by landlords and speculators, people unable to pay rents that become ever more expensive in comparison to their revenue. This tension attendant upon exercising power has resulted in a split opening up between two tendencies. The first, embodied by Pablo Iglesias, Podemos' founder and unchallenged charismatic leader, seeks to maintain links with the social movements it emerged from. It defends the rapprochement with Izquierda Unida (IU), the coalition including the Spanish Communist Party (PCE), insists on the people's" anger", thereby presuming to "frighten" the dominant classes, and cultivates a harder and more radical political tone and style – known as "quicklime", cal viva – that is uncompromising towards the Socialist Party. The second, embodied by Iñigo Errejón, wishes to conquer power by stepping up parliamentary involvement and dialoguing with the Socialist Party, whilst being wary of working too closely with Izquierda Unida. It prefers to speak of the "people" rather than workers, which is not systematic in the case in the first tendency, and opts for credibility over intimidation. Though both currents are in favor of a pacific and consensual electoral strategy, this takes broadly incompatible forms, sparking major friction in the medium-term. Three years after Podemos was founded, the Vistalegre II assembly, held in February 2017, saw the first current win a clear victory over the second, with 89.1% voting in favor of Iglesias as secretary general, and winning 37 (against 23) seats on the Consejo Ciudadano, the party executive. A third tendency, the Anti-capitalistas, also won a place on the executive for the first time, with two seats, including that of Miguel Urban. Anticapitalistas – the new name of Espacio Alternativo –, set up in 1995 by a group of activists from the Spanish Revolutionary Communist League – was key to the setting up of Podemos. The group managed to translate the 2011 Indignados social movement into a political force. It is significant that even Iñigo Errejon hailed from it, despite his subsequent turn towards social democracy – if this term is taken not in its original meaning of overthrowing capitalism, but as an attempt to gradually transform its structures. At the same 2017 assembly, the call by Ariel Jérez (coordinator for the Podemos Rural and Marine World Council) emphasized how important it was for the movement not to cut itself off from the countryside, where despite often being the hardest hit by the crisis, people still voted predominantly for the People's Party18 . Consideration of this assembly thus suggests that the trend was towards maintaining links with social protest movements and popular milieus, something that fed through clearly into the 2015 Podemos manifesto. This was far from being revolutionary, arguing for "pivoting the centre of gravity away from financial principles towards industrial principles". It set out steps to combat corruption, increase taxes on the highest incomes, increase welfare support, and introduce a universal income, together with a whole raft of policies to tackle the housing crisis. In Spain, the housing crisis was integrally bound up with financialization and banks' strategies. It resulted from the bursting of a massive speculative bubble fed by the commonplace granting of mortgages that were impossible to pay off. When it burst, the bubble triggered a mass movement rooted in working-class districts, and calling for the cancellation of debts and a right to housing. Podemos MPs translated these social demands into draft laws, calling for a series of specific measures including: an evaluation of public debt; the separation of retail banking from investment banking under the aegis of a public banking unit; the introduction of a simplified procedure for cancelling the debts of million of families affected by toxic loans; halting evictions for mortgage arrears and setting up a system for the "temporary transfer of housing" belonging to individuals and institutions owning more than ten empty lodgings, as presented to parliament on February 14, 2017. These two last measures, making it legal for people to requisition housing, attracted extensive criticism from the People's Party and the Socialist Party, who saw it primarily as an outright attack on property. These housing measures were amongst the most concrete and radical policies in a manifesto that, according to Enzo Traverso, was nevertheless more moderate than that of the French Unified Socialist Party in 197219 . Despite being led by a former minister of the interior, this latter party was in favor of self-governance, in a context where the entire European political spectrum had shifted leftwards. This was not the case at the period of Podemos, characterized by a dual sideways movement with the collapse of the centre ground. But how were these measures to be applied for as long as Podemos remained a minor parliamentary group with no executive power? And how could it continue to defend these measures on hostile ground if it cut itself off from those in need of them? The property crisis led to a halt in building, excess of available lodging, and an increase in the number of people evicted for being unable to pay off their mortgages. Bricks; photograph by Cécile Bodénès. In effect, if concern about Podemos' capacity to meet political expectations was particularly acute with regard to housing, it was because 604,000 eviction procedures were instigated in Spain for mortgage arrears between 2007 and 201421 . This caused many suicides in a country with, paradoxically, the largest proportion of housing units in the European Union, with 568 per 1000 inhabitants22 . Prior to the founding of Podemos in January 2014, this social contradiction had led to the Plataforma de Afectados por la Hipoteca being set up, as mentioned earlier. Several of its leading members went on to join Podemos and its allies, who now hold important positions in municipalities, parliament, and public institutions. Set up in Barcelona in 2009, the PAH is now present in 230 towns. At a local level it sometimes organizes itself into "banking groups" composed of clients from a given banking entity so as to act more effectively22 . As shown in this excerpt from a film of a PAH general assembly held in Madrid in 2013, and attended by two future Podemos MPs, the association has multiple objectives, and these are patiently explained. It is a question of wiping out the debts of those who contracted mortgages by transferring their lodging in lieu of payment, even when its value is lower than the level of debt; of obtaining rents proportional to real income; and of recuperating and retaining unoccupied housing. All of these demands duly appeared in the Podemos manifesto. A PAH general assembly followed by the halting of the eviction of a over-indebted Romanian builder. Two future Podemos MPs take part in the protest. Bricks; photograph by Cécile Bodénès. This type of action is part of a specific repertoire, to use the expression of Charles Tilly, which here comes into conflict with the mandate of parliamentarians23 . Although some MPs continue to attend protests – as called for in France by the France Insoumise MP François Ruffin – the vast majority of parliamentary actors turn their back on PAH activism. Such activism implies physical involvement, confronting the police at dawn to prevent evictions, occupying banks to demand the cancellation of debts, organizing gatherings in front of the homes of politicians – often MPs – responsible for the hated mortgage law. The "Judgement and Punishment" campaign, presented in the above excerpt, targets in particular leaders responsible for financial liberalization, such as Rodrigo Rato, the former minister of the economy and finance and former IMF president. In parallel to this political offensive, free individual and collective legal aid, psychological support, and economics courses are provided to the afectados hit by risky loans. It is this across-the-board movement that is behind the radicalization of popular milieus that led to Podemos' electoral successes, prior even to the the protest being generalized across the social field by the Indignados' movement. Certain cadres in the new party are finding it hard to relay the movement without participating in it directly – especially given that one wing of the party is placing ever greater emphasis on parliamentary work, as opposed to activism, and basing its appeal more explicitly on the technical and academic skills of the middle classes rather than on the more popular milieus of workers and employees behind its electoral victories. A political relay for social protest? By opening up a breach in financial power, the PAH has managed to prevent thousands of evictions. It has also altered dominant representations of banks, of the relationship to housing, and of the legal obligation pertaining to debt, together with the political consciousness of many over-indebted people. This interrupted the long ideological lineage bequeathed by the Spanish Civil War. In 1959, Franco's minister for housing, José Luis de Arrese, after a lengthy campaign to track down Republicans, stated: "we do not want a society of proletarians but of property owners", a policy which chimed with the Carlist, Falangist, and then Francoist vision of the "Christian revolution"24 . The change of tone brought about by the PAH was decisive in a country with over 79% of home ownership – a figure which only increased in the 2000s with the massive influx of risky credits, comparable to American subprimes, that wer common amongst the poorest strata of society, including immigrant construction workers from Morocco, Romania, and Latin America25 . This excerpt makes clear the importance of the activist work conducted by the PAH activist attorney Manuel San Pastor, who helped Podemos in the Madrid district of Alcorcón, who is here helping an Ecuadorian family from the Carabanchel district to avoid eviction. The difficult choice faced by this PAH activist, a former member of Communist Party, like other PAH and Podemos activists, was whether to go against the current and refraining from becoming fully involved in building the party so as to continue actively advocating the combat against evictions. The PAH's reputation is built on the very many actions of this type it has conducted, even in the remotest regions of Spain. It led to its spokesperson Ada Colau, being elected as mayor of Barcelona in 2015, at the head of the Barcelona en Comú electoral list with the backing of Podemos. In parallel to this, the anti-corruption magistrate Manuela Carmena (Ahora Madrid) was elected as mayor of Madrid after twenty-five years of the right in power. And in Valencia, it was the former trade unionist Joan Ribó (Compromís), with ties to liberation theology and then communist circles, who was elected. He replaced the incumbent, Rita Barbera, the local leader of the People's Party who had been mayor for the previous quarter of a century, and had taken over in turn after twelve years when the Socialist Party had held the city hall. Out of the eight MPs elected for Madrid in December 2015 – in addition to Pablo Iglesias, Carolina Bescansa, and Iñigo Errejón, the founders and leaders of Podemos – two were long-standing activists with the Plataforma de Afectados por la Hipoteca, namely Rafael Mayoral and Irene Montero, who figured in the first film excerpt. The latter is now, at the tender age of twenty-nine, the spokesperson for the Unidos Podemos–En Comú Podem–En Marea parliamentary grouping. After working with groups supporting afectados, they went on to play a critical role in the structuring of the parliamentary group, and are now part of the Podemos leadership. PAH members, however, are forbidden by its statutes from holding any "public office". Given that the work of an MP is time-consuming, they have devoted themselves wholly to their political tasks and to building Podemos, as has the MP from the province of Léon, Ana Marcello, another former PAH activist. If a fly enters a house and someone takes advantage of that to take out a revolver and kill their mother-in-law, you cannot say that he has shot at the fly. One may argue that this is what is happening in Podemos. Pablo Iglesias's current entourage, which no longer counts a single person amongst those who had been with him since the beginning, entered the party with an objective that can only lead to the destruction of the project. This accusation, coming from a former far-left activist who had rallied to Podemo's federating project, targets a group of activists from the Communist Party and Communist Youth, but also raises more generally the problem of what happens when a political party's initial social impetus starts to flag, leading to the loss of its centre of gravity. Seen this time from the perspective of the PAH, such a transfusion is heavy with a different kind of ambiguity, for it deprives the social movement of part of its strength. Podemos has announced that three regional delegates, José Ramón Blanco, Verónica Ordóñez, and Alberto Bolado, will take part with the Plataforma de Afectados por la Hipoteca (PAH) in the « #stop desahucio » [stopexpulsion] action that will be launched in Loredo (Ribamontán al Mar) on Wednesday, April 6 where a Kutxabank eviction is planned27 . All those who are in Podemos or Ahora Madrid are outside the PAH. Of course, we're traveling the same path, but they don't work here. One of them, for example, who doesn't hold public office but now works at Madrid City Hall, who I haven't seen for months – I think she still works for Ahora Madrid, for the municipal government –doesn't hold public office but isn't with us all the same. She works at the City Hall, organizing the Ahora Madrid municipal group, but not here. It's true that she comes to some coordination meetings, to some things, but that's all. […] We've analyzed the situation and it's true that we're a bit decapitated28 . This intriguing expression – how can one be "a bit" decapitated? – sums up the difficulties in terms of positioning and coordination between the social body and political head once they start partly living their own lives, to the point of becoming different organisms. A letter sent by the PAH to its former spokesperson Ada Colau, now mayor of Barcelona, about the many empty lodgings owned by the company for managing assets of banks nationalized during the economic crisis (SAREB), illustrates the conflicts now opposing social movements and their former comrades who have entered political institutions. One month ago you announced that the Municipality of Barcelona was finalizing negotiations with SAREB for the transfer of 500 empty apartments in Barcelona, which does not comply with law 24/2015 and may consequently be requisitioned. In the same press conference you declared that if SAREB and other banking entities did not accept these criteria, the obligatory transfer of empty lodgings in Barcelona would be set in motion. What has become of this measure? Have the requisitions started? For our part, we have stated that we will not settle for the 500 SAREB apartments, that we want all of them, that we want the requisition of all those which do not comply with the law, that is to say at least the 2591 empty lodgings which do not officially comply with the law in Barcelona29 . It's true that, in a way you don't see, they maintain a relationship with the PAH. They keep their conscience, and from what I see speak about our demands, but without presenting themselves in any way as being from the PAH. And I reckon that's good. Obviously there are people who badmouth them and accuse them of having used the PAH to enter parliament. But you don't end up in the parliament by chance, by wandering in off the streets! PAH 1: I thought it was positive for a first contact. The banks are going to release a certain number of lodgings, to have a sort of social housing fund in common with City Hall. But as that already exists, I said to them that it wasn't really the issue, but rather what were the criteria for being entitled to one. Because if the first criterion is that you must first have been thrown out [lanzado], the problem is the time between eviction and entering the new accommodation! PAH 2: What is certain is that all we were doing with everything we spoke about was knocking down straw men, it's a media fig leaf for the institutions. But what has really happened these past days? Those who went to City Hall told us that the program was a "set of propositions", including the question of housing. Propositions are not the same as commitment. Then we heard about an initiative that the banks liked a lot! PAH 3: Everyone knows that the lodgings they have put in this social fund are not simply "in poor condition", but totally smashed up. And the municipality agrees to do them up? That means that public money is being used to repair flats that have been stolen from us! They must think we're stupid! We should demand that the lodgings handed over be immediately inhabitable once the families arrive there30 . This type of debate has become part of the political routine, and raises the question of institutionalization at a different level. It is no longer solely that of distancing from the initial social movement, but explicitly that of internal conflict within the movement over the administrative and legal management of problems hitherto resolved by the power dynamic. Therein lies the ambiguity of the new political situation. For as long as an organization uses non-executive institutions – such as the legislature – as a political platform, the conflict remains within reasonable limits. But when it is a matter of institutions with comparatively extensive executive power, as is the case of city municipalities, conflict repeatedly flares up despite ties built up over time. In this case the dilemma of whether to participate in institutions is closer to that of Syriza, in power in Greece since January 2015, or of Akel, which governed Cyprus from 2008 to 2013, than it is to the Duma Bolsheviks30 . It is not a matter of seeking to effect a break from within, but of conserving the unity and efficiency of government without seeming to betray former allies, something which is often impossible. Since the beginning of the 2007 global economic crisis, a scenario of institutional radicalization has been played out in several countries against a backdrop of comparative separation from social protest movements (or at times total separation, depending upon the situation). From this point of view, Podemos is only one of the currents – albeit a particularly powerful one – in an international movement of contestation and destabilization of two-party systems. But it is far from clear that this truly amounts to a destabilization of the institutions themselves. It may be found with Bernie Sanders in the United States, part of whose support amongst young new Democrat cadres stems, directly or otherwise, from the Occupy Wall Street movement and its sympathizers. It may also be seen in the United Kingdom, where part of the Labour Party's social base, hit by the sub-prime crisis, supports the left wing embodied by Jeremy Corbyn. It is present in France, with the electoral breakthrough of La France Insoumise (FI) against the backdrop of the collapse of the Socialists, leading to a formation of a parliamentary group of seventeen MPs after the 2017 general election. It may be seen once again in Greece, where the Syriza coalition was broken when the party entered the traditional diplomatic game of repaying the country's debt. In most of these countries, the social shock of excessive debt and evictions, against a backdrop of the financialization of popular economies, has fed political dilemmas that are hard to resolve31 . Collective portrait of the sixteen La Montagne MPs elected in 1848. 19th-century engraving. But the history of such dilemmas is older than that of the parties encountering them, as we are reminded by this criticism by Marx of the recently elected La Montagne revolutionaries in France, who were in favor of setting up the first Ministry of Labor in 1848: "A special Ministry of Labor! But the ministries of finance, of trade, of public works – are not these the bourgeois ministries of labor. And alongside these a proletarian Ministry of Labor could only be a ministry of impotence, a ministry of pious wishes"32 . The ministry in question nevertheless led to an increase wages, social housing, and the taking in of foreign workers. But the socialist activist who held the portfolio, Louis Blanc, soon saw his initial objectives watered-down, and then abandoned, by the daily reality of his work as an MP and then minister. Jacques Bouillon, « Les démocrates socialistes aux élections de 1849 », Revue française de science politique, n° 6-1, 1956, p. 70-95. Pierre Broué, Le Parti bolchevique. Histoire du PC de l’URSS, Paris, Minuit, 1972. Daniel Guérin, Front populaire, révolution manquée, Paris, Agone, 2013. Richard Cloward, Frances Piven, Poor People Movements : Why They Succeed, How They Fail ?, New York, Vintage Books, 1977. Suzanne Staggenborg, « The survival of the women’s movement : Turnover and continuity in Bloomington, Indiana », Mobilization, vol. 1, n° 2, 1999, p. 143-158. Selon les économistes espagnols, le seul secteur de la construction a atteint 18% du PIB du pays, sans compter les emplois induits dans les autres secteurs liés à l’immobilier : José García Montalvo, « Crisis éconómica y dinámica del ajuste inmobiliario en España », curso de Verano de la Universidad del País Vasco y la Fundación de Cajas de Ahorros del País Vasco, 9 septembre 2009 ; José García Montalvo, « Financiación inmobiliaria, burbuja crediticia y crisis financiera : lecciones a partir de la recesión de 2008-2009 », Papeles de Economía Española, n° 122, 2009, p. 66-85. Même plusieurs années après l’éclatement de la bulle immobilière, en 2013, la part de l’immobilier dans le PIB espagnol reste élevée : 13 % selon Marta Otero Moreno, Joaquín Blanco García Lomas, « El sector inmobiliario en España », Instituto de Estudios Económicos, 2014. Selon le Consejo General del Poder Judicial, 671 943 procédures d’expulsion ont été initiées entre 2007 et 2015. Héloïse Nez, Podemos. De l’indignation aux élections, Paris, Les Petits Matins, 2015 ; Alberto Amo, Alberto Mínguez, Podemos, la politique en mouvement, Paris, La Dispute, 2016 ; Alicia Fernández, Mathieu Petithomme (dir. ), Contester en Espagne. Crise démocratique et mouvements sociaux, Demopolis, Paris, 2015. En Comú Podem, formed in October 2015, comprises five political groups: Barcelona en Comú (a citizen platform headed by Ada Colau, former spokesperson of the Plataforma de Afectados por la Hipoteca (PAH) movement for the right to housing, and now mayor of Barcelona), Equo (an environmental party founded in 2011), EUiA (the Catalan equivalent of Izquierda Unida), ICV (a Catalan environmental party with communist leanings), Podem (Podemos in Catalonia), and Proceso Constituyente en Cataluña (an anti-capitalist separatist organization). “Bescansa vuelve a visibilizar en el Congreso el problema de la conciliación”, Público, November 17, 2016. "De la casta a las rastas: el Parlamento experimenta un cambio de política aspirando a la identificación ciudadana", El País, January 14, 2016. Alexis Badaev, Les Bolcheviks au parlement tsariste, Paris, Bureau d’Édition, 1932. En Espagne, le mouvement des Indignés est plus fréquemment appelé « 15-M », car il est né le 15 mai 2011. Podemos est crée trois ans plus tard, en 2013, et traduit une nouvelle étape de la mobilisation sociale, en des termes institutionnels et électoraux. La PAH, quant à elle, est antérieure : elle est créée officiellement à Barcelone en février 2009. La PAH est issue d’un mouvement social de masse regroupant les « affectés par le crédits » dans plus de 230 villes et villages d’Espagne, contre les expulsions de logement pour crédits impayés et pour l’annulation des dettes par l’occupation systématique des banques et la grève des remboursements. Pablo Iglesias Turrión, Multitud y Acción Colectiva Postnacional. Un estudio comparado de los desobedientes : de Italia a Madrid (2000-2005), Phd Dissertation, University Complutense de Madrid, 2008. Immanuel Wallerstein, « Structural Crises », New Left Review, n° 62, 2010, p. 133-42. L’interprétation est hétérodoxe dans le sens où l’idée de contre-hégémonie passe chez Gramsci par une « guerre de position » induisant une rupture révolutionnaire avec le capitalisme, ce qui devient chez Chantal Mouffe et Ernesto Laclau une « multitude de ruptures, pour défaire les nœuds autour desquels l’hégémonie actuelle est structurée ». Iñigo Errejón, Chantal Mouffe, Podemos in the Name of the People, Londres, Lawrence & Wishart, 2016, p. 41. Ludovic Lamant, Squatter le pouvoir. Les mairies rebelles d’Espagne, Montréal, Lux, 2016. Ariel Jérez, « La patria rural », El Despertador 3.0, 2017. Enzo Traverso, Les Nouveaux visages du fascisme, Paris, Textuel, 2017. Consejo del Poder Judicial, Memoria sobre el estado, funcionamiento y actividades del consejo general del poder judicial y de los juzgados y tribunales en el año 2014, 2015. Lorena Mullor, "A Proposal for the Spanish Mortgage and Housing Market", Mortgage Info, no. 1, January 2009, p. 1-2. Ada Colau, Adrià Alemany, ¡Sí se puede! Crónica de una pequeña gran victoria, Barcelone, Destino, 2013. Charles Tilly, « Les origines du répertoire d’action collective contemporaine en France et en Grande-Bretagne », Vingtième Siècle, vol. 4, n° 1, 1984, p. 89-108. Sophie Laura Gonick, At the Margins of Europe : Homeownership, Inclusion, and Protest in Contemporary Madrid, Thèse de doctorat en Urbanisme, UC Berkeley, 2015. Certains chiffres indiquent même près de 90%. Ici, on garde le taux le plus bas de l'Instituto Nacional de Estadísticas, Censos de Población y Vivienda, 2011. Dans une autre étude de l’INE sur les foyers espagnol, les chiffres de 30,1 % des foyers ayant encore à rembourser leur prêt, contre 48,8 % de propriétaires de plein droit, relativisent fortement le sens du statut de propriétaire et soulignent l’importance du crédit. Instituto Nacional de Estadisticas, « Encuesta continua de Hogares. Año 2013 », Notas de prensa, 2013. 20 minutos, April 3, 2016. Interview at the PAH premises in Madrid, March 2016. The full text of this letter may be found in Catalan and in Castilian on the PAH website. The film of this conversation may be seen in Bricks: 1’13’46 to 1’16’30. Lamprini Rori, « De la contestation au pouvoir. Les ressorts de l’ascension électorale de Syriza », Savoir/Agir, vol. 2, n° 32, 2015 : « Syriza est passé de la contestation au mainstream politique, des composantes alternatives à l’organisation partisane classique, de la rhétorique de la désobéissance et de la révolte à la victoire électorale et la réforme de l’État ». Dans ce panorama, le scénario politique français est un peu différent, car il n’y a pas eu de formation d’une bulle immobilière massive, déterminant les choix industriels pendant des années, et s’effondrant brutalement : l’expression politique de la crise s’y formule donc d’une façon moins brutale. Il n’y a par exemple pas de mouvement social de masse à l’origine de la France Insoumise, mais plutôt un appel d’air liée à la crise du parti socialiste. Karl Marx, Les Luttes de classes en France , Paris, Gallimard, 2002. [without author], Consejo del Poder Judicial, Memoria sobre el estado, funcionamiento y actividades del consejo general del poder judicial y de los juzgados y tribunales en el año 2014, 2015. Alberto Amo, Alberto Mínguez, Podemos, la politique en mouvement, Paris, La Dispute, 2016. Rubén Amón, “De la casta a las rastas: el Parlamento experimenta un cambio de política aspirando a la identificación ciudadana”, El País, January 14, 2016. Joaquín Blanco García Lomas, Marta Otero Moreno, “El sector inmobiliario en España”, Instituto de Estudios Económicos, 2014. Jacques Bouillon, “Les démocrates socialistes aux élections de 1849”, Revue française de science politique, n° 6-1, 1956, p. 70-95. Richard Cloward, Frances Piven, Poor People Movements : Why They Succeed, How They Fail?, New York, Vintage Books, 1977. Iñigo Errejón, Chantal Mouffe, Podemos in the Name of the People, Londres, Lawrence & Wishart, 2016, p. 41. Alicia Fernández, Mathieu Petithomme (eds. ), Contester en Espagne. Crise démocratique et mouvements sociaux, Paris, Demopolis, 2015. José García Montalvo, “Crisis éconómica y dinámica del ajuste inmobiliario en España”, curso de Verano de la Universidad del País Vasco y la Fundación de Cajas de Ahorros del País Vasco, September 9th 2009. José García Montalvo, “Financiación inmobiliaria, burbuja crediticia y crisis financiera: lecciones a partir de la recesión de 2008-2009”, Papeles de Economía Española, n° 122, 2009, p. 66-85. Sophie Laura Gonick, At the Margins of Europe: Homeownership, Inclusion, and Protest in Contemporary Madrid, Phd Dissertation, UC Berkeley, 2015. Pablo Iglesias Turrión, Multitud y Acción Colectiva Postnacional. Un estudio comparado de los desobedientes: de Italia a Madrid (2000-2005), Phd dissertation, Université Complutense de Madrid, 2008. Ariel Jérez, “La patria rural”, El Despertador 3.0, 2017. Lorena Mullor, “A Proposal for the Spanish Mortgage and Housing Market”, Mortgage Info, nº 1, january 2009, p. 1-2. Héloïse Nez, Podemos. De l’indignation aux élections, Paris, Les Petits Matins, 2015. Suzanne Staggenborg, “The survival of the women’s movement: Turnover and continuity in Bloomington, Indiana”, Mobilization, vol. 1, n° 2, 1999, p. 143-158. Charles Tilly, “Les origines du répertoire d’action collective contemporaine en France et en Grande-Bretagne”, Vingtième Siècle, vol. 4, n° 1, 1984, p. 89-108. Lamprini Rori, “De la contestation au pouvoir. Les ressorts de l’ascension électorale de Syriza”, Savoir/Agir, vol. 2, n° 32, 2015, p. 61-71. Immanuel Wallerstein, “Structural Crises”, New Left Review, n° 62, 2010, p. 133-42.